Geographers and cartographers have always found the North Pole to be something of a disappointment. It is just water covered with ice, the same as could be found on any mill-pond in the winter. As long as the high Arctic remained an inaccessable mystery, they remained free to speculate about what might be there, lands of untapped wealth, mysterious natural phenomena, a navigable ice-free sea, or lost valleys of mammoth-riding vikings. Okay, I made that last one up, but the other three all had supporters during the early modern era. These speculations were not wild guesses, but informed speculation based on real--though flawed--historical and scientific information. One of the last proposals, before explorers finally penetrated the pole, combined land and open sea. The first cartographers to attempt to make globes and map the whole world during the Renaissance placed four great islands in the North. The four divided the polar region into equal quarters, seperated by rivers or straits. These rivers flowed inward to a whirlpool at the pole where the water gurgled through the Earth to emerge in the Antarctic. The pole also featured a magnetic black island that caused comasses to point north. Some maps indicated that one of the islands was populated by pygmies. This arrangement was not something that the mapmakers made up just to avoid empty space on their maps. Strange Maps has a wonderful example of one such map by the pioneering Flemish cartographer Gerhard Mercator. It was said to come from an account--now lost--of the travels of a Franciscan monk, written in the forteenth century. As mariners pushed further north it soon became clear that the four islands did not exist and the magnetic pole was someplace north of Canada. A large part of the wishful thinking about the poles involved finding a shorter passage between Europe and the riches of the Orient. Hundreds of men died cold, miserable deaths hunting for Northwest and Northeast passages in the four centuries after Columbus and da Gama. As hopes of finding an easy passage along the coast of North America or Eurasia faded, geographers in the nineteenth century revived an old theory that an open polar sea lay just beyond the ice-pack. The idea seem counter-intuitive today, but the geographers of the time were able to marshal an impressive list of reasons why it was possible. Some scientists had calculated that the decrease in temperatures as one traveled north would bottom out at around eighty north and then grow warmer near the pole. Northern explorers reported birds, polar bears, and other animals migrating north in the summer, which wouldn't make any sense unless they had somewhere to go. Another line of thought reasoned that pack ice grew out from land and wouldn't form on open water. A final theory involved warm ocean currents. The Gulf Stream flows up the East Coast of North America and then crosses the Atlantic to warm the British Isles and Norway. Open polar sea proponents argued that the current could keep its heat long enough to flow north of Siberia and join a hypothicized warm counterpart flowing in through the Bering Straits. These two currents would then form a large pool of warm water around the pole. The open polar sea theory had a number of very influential supporters. John Barrow, Second Secretary of the British Admiralty during the first half of the nineteenth century, controlled the purse strings for British exploration. Matthew Fontaine Maury, the Superintendent of the US Naval Observatory, produced charts of the world's winds and ocean currents that were unprecidented for their accuracy and utility. Joining them was August Petermann founded the journal Mittheilungen aus Justus Perthes’ Geographischer Anstalt über wichtige neue Erforschungen auf dem Gesammtgebiete der Geographie (Reports from Justus Perthes’ Geographical Institution upon Important New Investigations in the Whole Subject of Geography), better known as Petermann's Journal, the leading clearinghouse for new information brought back by explorers in all parts of the world. All three men wielded international influence and, between them, set the program for polar exploration. 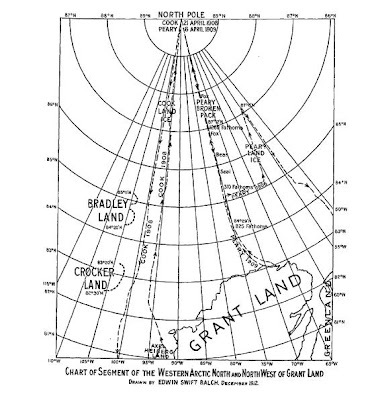 Petermann's vision combined the open polar sea with a polar land mass. Though smaller than the sixteenth century, polar lands, Petermann's transpolar land was quite respectable in size. As the coast of Siberia became better known in the late eighteenth and early nineteenth century, explorers added large islands and groups of islands to the map, some real and some mirages. * Petermann argued that the easternmost of these islands--Wrangel Island and possibly others--were connected to Greenland and the Ellesmere Islands a a single land mass or archipelago. Petersmann summed up his scheme as two articles and a map in his journal in 1865. Petermann's 1865 map shows the Gulf Stream continuing across the north of Eurasia as far as the Bering Straits. In the East he labels the warm current "Polynya of the Russians" which refers to several open water regions reported by explorers. 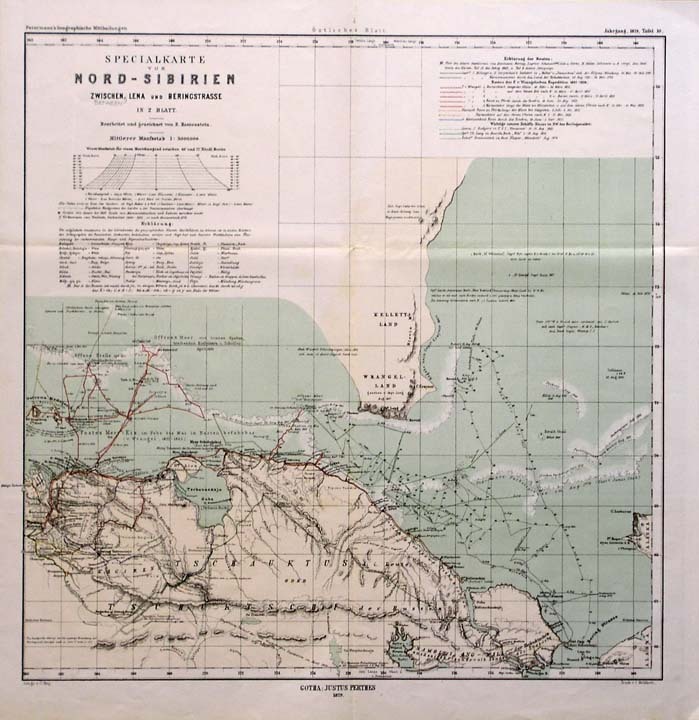 Petermann reasoned that these regions joined together with the Gulf Stream to form a single continuous navigable zone a few hundred miles north of the Siberian coast. Where he has shown Greenland and Ellesmere Island combining, Petermann inserted a large bay, labeled "Kane [something ] Sea" (at least, that's what it looks like to me). In 1855, an American, Elisha Kent Kane returned from exploring the western coast of Greenland to report that the coast turned eastward north of Smith Sound. Rather than believe that this was the northern end of Greenland, Petermann inserted his hypothetical sea. Further north, the Transarctic land is labeled "Probably land or islands (Petermann)." The Asian end of the land is not labeled at all, even though it is almost exactly where Wrangel Island sits. Baron Ferdinand von Wrangel explored the northeastern coast of Siberia in the teens and twenties of the nineteenth century. While he disproved some of the phantom islands, Wrangel predicted a major island where one would be found forty years later. The first European to site the island was and English captain, Henry Kellett in 1849. The first Europeans to set foot on the island arrived in 1866 and 1867, right after Petermann's map was published. 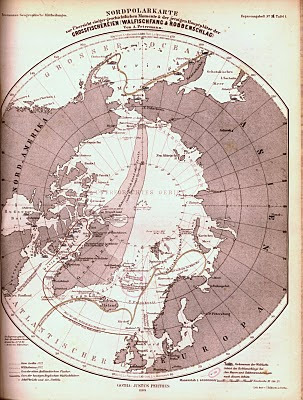 Four years after his first Arctic map, Petermann published a second. The general outlines of his hypothetical transpolar land are the same, but Petermann has made some minor changes. Kane's Sea is smaller and no longer has a name, but Peterman has named more of the newly discovered landmarks around it. At the Asian end of the land, Pteremann has maked Wrangel Island as confirmed land, but refuses to use the name "Wrangel Island." Petermann thought the island should have been named after Kellett (Kellett thought it should be named Plover Island). A third map, published a year after Petermann's death, illustrates how his ideas lingered on. By this time, many explorers had visited the southern part of Wrangel Island and the name had become firmly established. Yet at this late date, there was still room to speculate about the possiblity of more land closer to the pole. The known parts of Wrangel Island are labled "Wrangel Land." Further north, a range of mountains sit in Kellett Land. Further north still are more mountains with a legend I can't make out. All three are connected by a speculative coastline which continues north off the map. 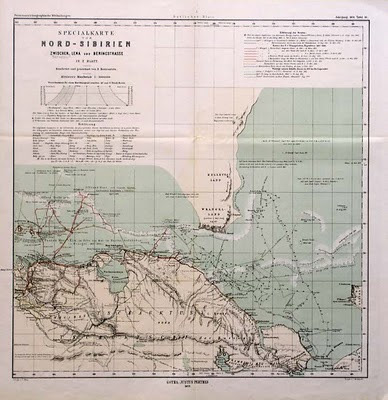 Shortly after the 1879 map was published, George de Long sailed around the north side of Wrangel Island proving it was not part of a greater landmass. The northern end of Greenland remained a mystery into the next century. Even then, there were those who held out for more land in the north. 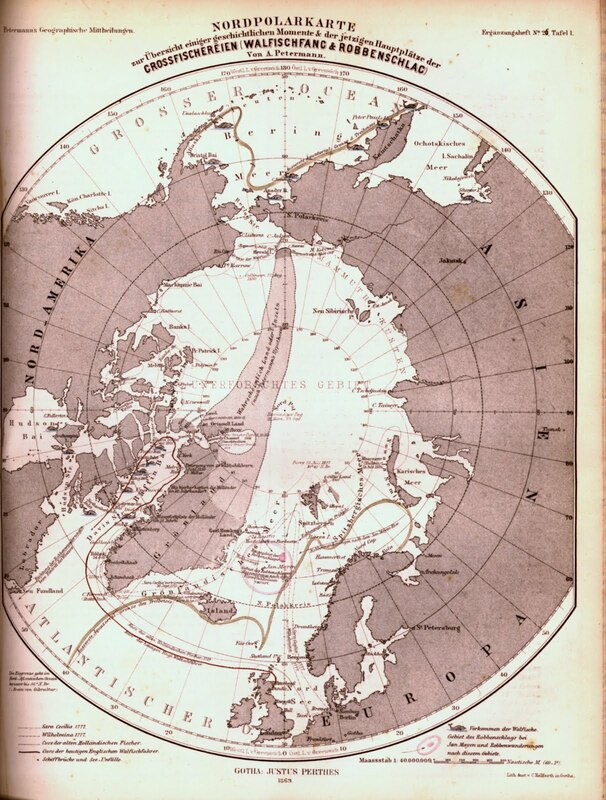 In 1906, Robert Peary named Crocker Land north of the Ellesmere Islands. In 1909, Frederick Cook named Bradley Land north of that. Neither has even a trace of existence. In the twentieth century, cold machines have removed the last mystery from the Arctic. Millions of travelers have flown over the pole. Satellites have photographed every inch of the Arctic and subjected it to study in every wavelength. Submarines are mapping the ocean floor beneath the ice. Soon the ice will be all but gone in the summer. The only new land to be found in the Arctic is the land being uncovered as the glaciers melt back on Greenland, Svalbard, and the Canadian Arctic Islands. In their way, machines and global warming have ended the disappointment of the Arctic. It's no longer endless boring ice. It's an economic frontier and an environmental emergency. And as it changes, we'll always need more new maps. * One of the persistent mirage lands was Sannikov Land, named for Yakov Sannikov who reported seeing a large land mass noth of the New Siberia Islands in 1811. Reports of Sannikov Land continued to show up all through the nineteenth century. In 1903, Baron Eduard von Toll and four companions died looking for it. 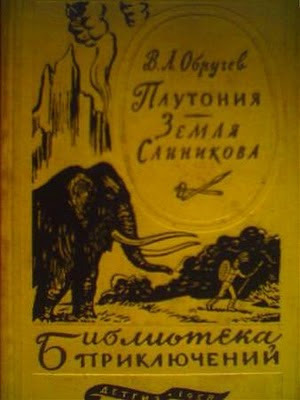 In 1926, Vladimir Obruchev, an influential geologist and early Soviet science fiction author, published a lost world novel set in Sannikov Land. His land featured woolly mammoths but no vikings. Sannikov Land was made into a movie in 1973.